One of my favorite meals growing up was red beans and rice. It’s the ultimate comfort food in my book but I’ve never made it before because my husband swears that he doesn’t like beans. And well, beans are kind of a big part of red beansÂ and rice. But I took a chance recently and crossed my fingers that it would go over well. And go over well it did! It was just as comforting as I remembered it being and was perfect on a snowy day! Awesome, easy recipe that requires zero bean soaking! And I bet you have almost everything you need in your pantry right now. The recipe calls for the slow cooker to start on high and then be turned down to low after a few hours of cooking but I imagine that if you soaked the beans overnight, you could just cook them on low the entire time. Combine everything but the rice in a slow cooker. Cook on high for 4-5 hours; turn down to low and cook another 3-4 hours or until the beans are tender. Serve over rice. 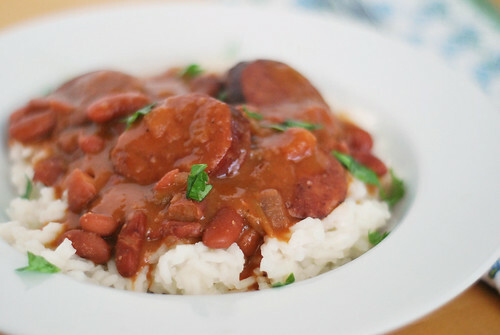 13 Responses to "Slow Cooker Red Beans and Rice"
Love that you don’t have to soak the beans! This looks so yummy! I’m another bean-lover who lives with a bean-hater. I will have to see if I can sneak this past him because it looks delicious! Love red beans and rice! And I also love my Slow Cooker ! I’m definitely giving this recipe a try! Oh gawd, this looks so filling and delicious. I’ve been meaning to try my hand at red beans and rice for a while now. Big plus you don’t have to soak them too! Let’s all get together and send our bean-hating men away and stuff ourselves with this comfort food. Kay? As strange as this may sound, I’d never heard of beans and rice until you and Pam mentioned it on twitter. I LOVE new ideas to use beans…there such a great source of protein and supper cheap! 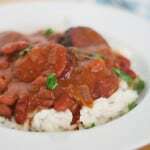 I’ve been wanting a good red beans and rice recipe to try. And in the crock? 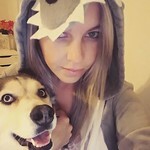 Perrrfect! The recipe sounded delicious but it didnt work for me. I’m from the Caribbean as is my husband and it was bland, even though I added two more garlic cloves and added a full tsp of thyme, plus a whole Scotch Bonnet pepper. It was quite watery, not thick like the photo. My husband tried it and asked if I forgot the garlic. I’ll try it again and probably add the spices at the end.